Reading the poems in Anthony Wilson’s Riddance I had the sensation of walking through a large house, switching on lamps and spotlights to illuminate not immediately visible nooks and crannies. Nowhere is there one garish light explaining everything at once and, although the book is divided into five sections, I felt inclined to move freely within the house, revisiting the poems I found the most satisfying, and there are many of them. Riddance documents Wilson’s personal experience of cancer, from initial diagnosis and treatment to the tentative relief of being in remission. But Riddance is the opposite of a depressing read. I echo Sprackland’s sentiments, feeling uplifted by Wilson’s gratitude for an afternoon in the garden, books arriving by post, a cup of coffee followed by two hours writing time, a muddy bike ride. In facing death he witnesses, in exquisite detail, the pleasure to be found in small things. Wilson’s evident love for life is contagious and humbling and there are moments of delicious humour when, for example, he contemplates his own funeral “I want it kept simple. / I want to leave one part / of the congregation / thinking they witnessed / a jazz improvisation,” (For Afterwards). 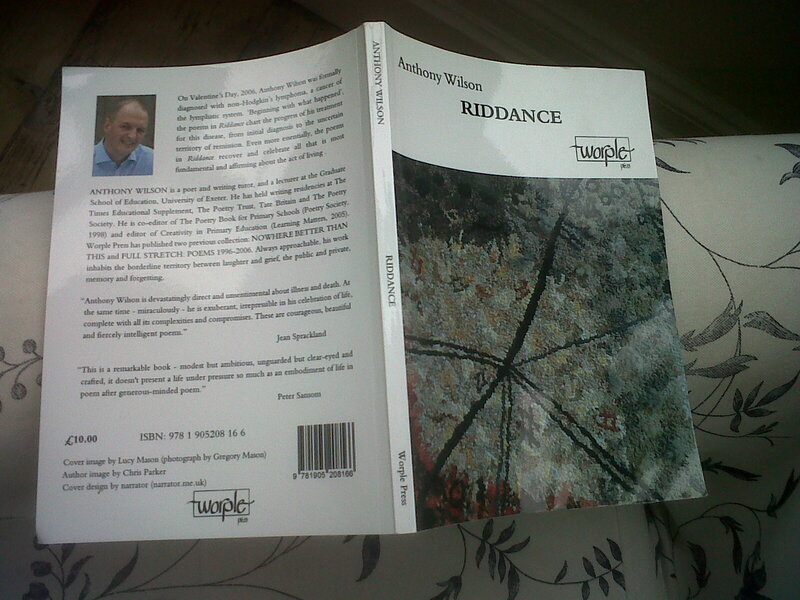 Riddance, deservedly, is receiving excellent reviews and will certainly gather no dust on my poetry shelf. A link to Anthony Wilson’s website and more details of Riddance here.